The bishop of the Leiria-Fatima diocese, Monsignor Antonio Marto, complimented this afternoon, in the opening day of the new triennium that the Shrine presented, the “originality of the centennial celebration” between 2010-2017, without minimizing the celebrations to a year of activities, but with a new “global” approach which allowed people to reach “the centre of the Message”. These last seven years permitted us to create a “new approach” to the Message of Fatima, said the prelate, with a “attitude and attitudes change” moving from a “merely devotional” vision or “sometimes morbid” curiosity over the secrets, to looking the events in Cova da Iria “in their whole”, reaching its nucleus and looking at its actuality. The diocesan prelate took the chance to project a new cycle of Fatima marking the lines which remain from the Centennial. Among them, two are particularly important: the mystic and the prophetic dimension. “The mystic dimension of Fatima was often covered only by the devotional aspect”, said Monsignor Antonio Marto, to who is necessary to underline the invitation made by Our Lady to open the human heart to God “in times of disbelieve and indifference”. The Bishop of the Leiria Fatima diocese pointed that Fatima “accompanies the history of mankind each time period” and that the “great present” of the Centennial was the canonization of the little shepherds Francisco and Jacinta Marto, “without which this Centennial wouldn’t be completed”. The diocesan prelate underlined the repercussion the canonization had in the visitations to the tombs increase and seized the moment to share a comment made by Pope Francis in a private audience he granted last September 30th, regarding the little shepherds life example: “Today, people seek innocence in a disturbed world”. The Leiria Fatima diocese bishop also reminded the request Pope Francis made in the last May pilgrimage, about the necessity of a “purification of the devotion to Our Lady”. On the other hand, and with eyes set on the daily routine of the Shrine, Monsignor Antonio Marto emphasised the “universality” and the “national and global projection of Fatima”, especially in this year of 2017, highlighting in a particular way the groups of pilgrims coming from Asia, with a specific reference to Catholics from continental China. The prelate, who ended his intervention with a quote from Saint Augustine, urging the Shrine to guard and care for this gift, “so that the Message can shine with all its straight, renewing and converting hearts”, emphasized that those who come to Fatima don´t come as “mere tourists” but “touched by the heart”. 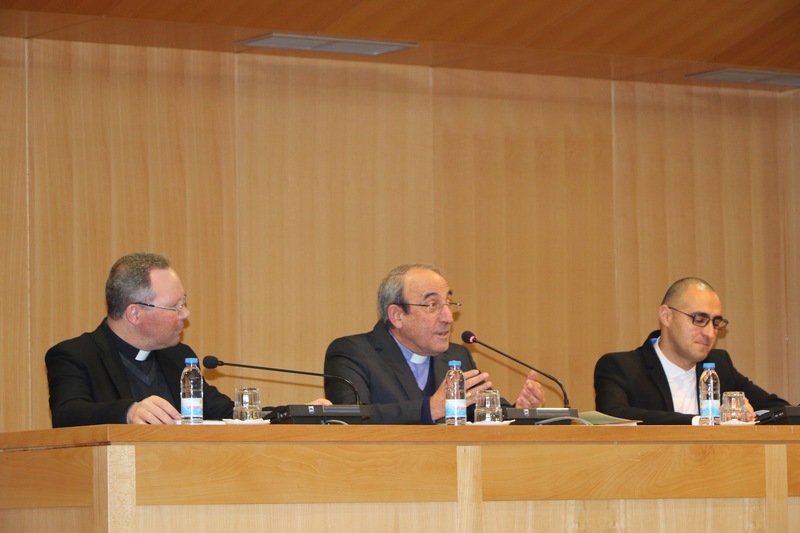 The opening day of the 2017-2018 new pastoral year also counted with a conference by the Portuguese Catholic University professor, Jose Rui Teixeira, who spoke of Cova da Iria as a place of “intercessions and intersections”, a “poetics”, a space where the pilgrims “seek to touch and end up being touched”. “Fatima is the edge of the mantle, it is a place of intercession and intersection, the periphery where the cure happens”, he stated, reminding that “it is a place where we expose ourselves to the mercy of God, a waiting place… where we are visited”. The theologian, who presented the year’s theme from the experience and vision of the pilgrim, pointed out what makes Fatima so special and current: “Fatima is circumstantial. But it is in the light of the circumstantial that the essential fructifies, in each one´s life, in a state of grace. And it is in the light of the essential that we can be thankful for the gift of the circumstantial”. The opening day also counted with a special musical moment from the Schola Cantorum Little Shepherds of Fatima, under the direction of conductor Paula Pereira, the presentation of the 8th and last issue of the cultural magazine Fatima XXI and the presentation of the Centennial commemorative medal to five institutions which the Shrine desired to distinguish for their intense and useful collaboration, particularly, in this Centennial year of Fatima.